Yellow dal Poori or Leftover dal poori recipe is a soft and flavored poori recipe which you can serve with any regular side dish. It is a great way to use of leftover dal recipe. Tadka dal gives the really amazing flavors to poori. I made yellow dal twice a week and leftover dal is big problem in every Indian house. Today I shared one of popular recipe from my kitchen i.e. leftover dal ki poori. It’s quite same as dal ka paratha recipe, you have to just fry them and serve along with mango pickle or aloo ki sabzi as Sunday brunch. I’m sure you will love it. You can serve this poori with any gravy such as Aloo ki sabzi, Aloo Matar ki sabzi, Bharvan Lauki, Paneer Pasanda and more. If you like Poori or fried Indian puffed Breads, check these recipe also: Farali Poori, Banana Poori, Bajra Poori and Nagori. Combine all ingredients together in big bowl and knead into stiff dough. Cover and keep aside for 10-15 minutes. Heat the enough oil in wok. Divide the dough into equal portions and roll out each portion into a thin disc and keep aside. When oil is hot enough, gently add the rolled disc one by one. Cook till to puffed and slightly brown from the both sides. Remove from the oil onto kitchen towels. Serve hot with any gravy dish or aloo ki sabzi. Yellow dal Poori or Leftover dal poori recipe is a soft and flavored poori recipe which you can serve with any regular side dish. It is a great way to use of leftover dal recipe. Combine all ingredients together in big bowl and knead into stiff dough. Heat the enough oil in wok. Divide the dough into equal portions and roll out each portion into a thin disc and keep aside. When oil is hot enough, gently add the rolled disc one by one. Cook till to puffed and slightly brown from the both sides. Remove from the oil onto kitchen towels. Serve hot with any gravy dish or aloo ki sabzi. Thats truly incredible to finish leftover dal this way. Poori looks absolutely fluffy and puffy to enjoy just like that. Those puffy beauties are super tempting and irresistible to the core. Great recipe with leftover daal . Giving a makeover to the daal you have got an awesome poori which is tempting and well served . Using up leftover dal is such a great idea to make delicious parathas or pooris. I love using leftover moong dal as it adds a wonderful earthy taste. Those pooris look fantastic Preeti. Using the left over dal is indeed a great idea. I would love this with aloo sabzi. The leftover dal poori looks so so yum. I bet they would have tasted so delicious. I too make leftover dal roti or pancakes and is a good way to use the leftovers. This looks fantastic poori preeti. The color looks amazing. Very nice. 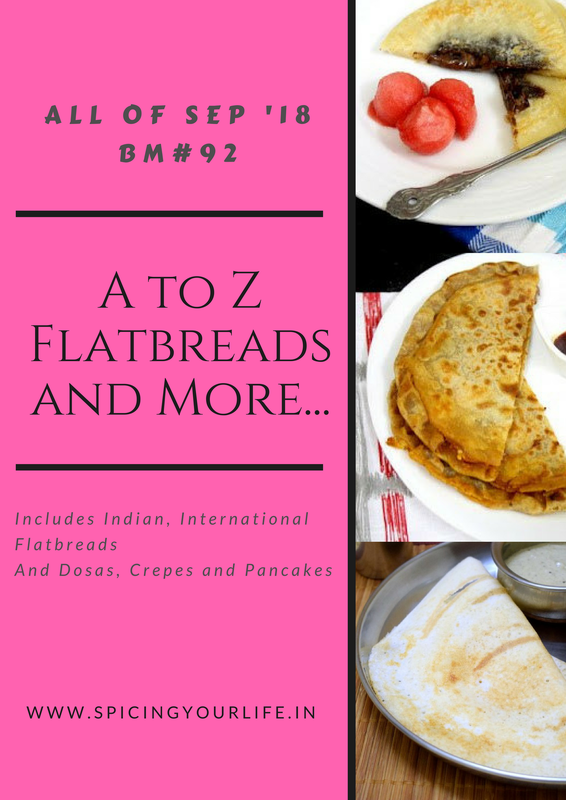 I too used yellow moong for this alphabet but made parathas with it. Your poori idea sounds even more delicious Preeti. we keep making dal puri so often with leftover dals. so tasty and yummy. This is a great recipe to use the leftover dal. Love these pooris and I will definitely be making these soon.